Shonto Begay is of the land and the land is of him. His intimate experience of Navajo lands in their physical and spiritual manifestations fill his life and fill his vibrant canvases. Nothing is too insignificant to be celebrated in a canvas or to be a tool for learning. Free From the Tethers of Motion #2 is a scene that might not even register to many passersby, or would elicit feelings of revulsion. 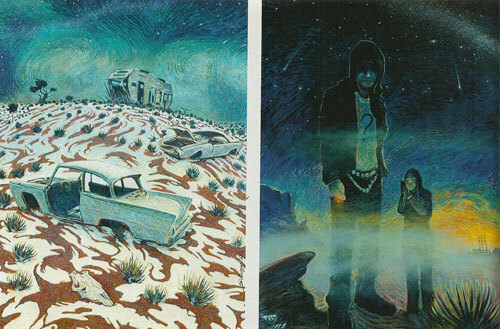 Begay's title already moves us beyond the physical reality of wrecks on a hill, once someone's pride and joy. Just as animals die and leave their skulls behind, worn-out vehicles slowly becomd stripped and rust into the soil. Begay observes "what once moved and held stories now in their rusting resting grounds...someone lived and shared words within them..."
There are further levels of meaning. "Metaphorically," he says, "it is the brilliance in the darkened sky from the darkened earth, when what save us is reaching into the only light sprinkled above, allowing us to stand, our arms raised, our minds eye tickled. This is our salvation...sometimes." Free From the Tethers of Motion #2, acrylic on canvas, 48"x36" Rez Hoodies, acrylic on canvas, 48"x36"
Begay is a painter, lecturer, and author, as well as a spokesperson for environmental rights. Rez Hoodies could be a reference to popular culture's notions of the hoodie as a symbol for the "other." The question mark on the T-shirt of one of the boys is a big one. The boys are not standing in the midst of dawn. They may be standing in the midst of death. In the background is a glowing power plant spewing smoke and pollutants into the air and he boys' breath. Begay says the painting portrays "the disconnect that occurs to Earth-based religion and peoples when corporations with no hearts come and take your grazing land that holds the bones of your ancestors. 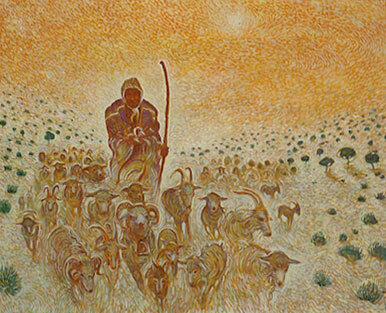 The youth are ripped away from the land..."
Shonto Begay, Dante and Salvador on the Keet Seel Trail, acrylic on canvas, 36"x48"
A Late Golden is the land as it should be - a shepherd and his flock in the unpolluted land of his ancestors. 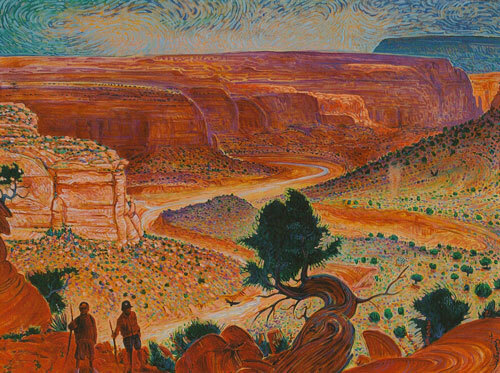 Begay's short quick brushstrokes represent the energy of the sun, the movement of creatures through the landscape, and the spirit of the land itself. He writes, "I have always had a love for art. From a very young age I found excitement in the experience of drawing. To recreate facets of my universe in varying degrees has always been my life's adventure." Shonto Begay, A Late Golden, acrylic on canvas, 36" x 48"